Re : Zero kara Hajimeru Isekai Seikatsu ( Re : Zero - starting life in a new world ) , is a 2016 adaptation of Tappai Nagatsuki’ Light novel series. It had previously been given three manga adaptations. The studio White Fox has only been in charge of 21 projects before ( including specials and shorts ) but most of their creations have been very well received , including 2014s summer hit Akame ga Kill and the iconic Steins : gate. The best way for me to describe Re : Zero is to say that White fox took the dark fantasy world of Akame ga Kill but combined it with a story and characters that share the depth of Steins : Gate. Having sat through every single mediocre fantasy series that came out this season , Re : Zero is completely mind-blowing. It has charm , humour , great characters but can also handle the darkness that comes with a dark fantasy world. Despite the paragraph above , the story is actually quite simple. The NEET main character being summoned into a parallel world is nothing new and some of you might be reminded of ,Konosuba from last season. His power , to be able to come back from death and having a knowledge of the future also ideas that have been done before , Mirai Nikki. 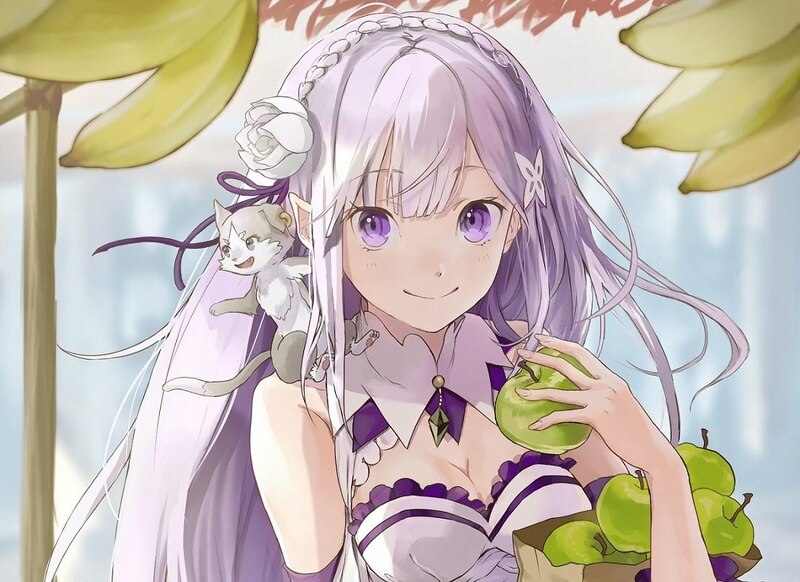 What really drives Re : Zero though is how it handles the way the main character adapts to the world and how living in a fantasy world would change a person. The humour is great and as someone who loves the fantasy genre , having the show constantly flip my expectations and predictions on their head was entertaining. Some of the shows strongest points are when it’s deconstructing how anime handles dark fantasy and the tropes and storytelling devices. If you’ve seen your fair share of anime fantasy you’ll enjoy these sequences far more. The story is very ambitious trying to master two tones , a happy romantic comedy and an incredibly violent and quite depressing story. I think this is handles very well. The art-style aids greatly in making it work and the show always signals when things are going to get flipped so it’s never really a surprise. The suspense and tension are handled really well , the writing and direction are very accomplished and creating a sense of unease when needed. The music is decent , fitting for the medieval setting , and is paired to scene almost perfectly by Jin Aketagawa ( Aldonoah Zero , Highschool DXD) who, seemingly, does the sound direction for every other anime these days. Not a surprise as what helps the very two toned story stay focused is the very distinct music separating the two , it’s never unclear and that’s a great asset to have. The world is a gorgeous euro-style medieval fantasy. The art-style is simple but paired Yoshito Takamines brilliant direction it showcases both the lustrous beauty of a realm filled with magic and sword-fighting but also the violence , poverty and harshness that a world like that is inevitably filled with. Takamine has worked very closely with Studio White Fox on several on their recent projects , Akame ga Kill , The Devil is a Part Timer so anyone familiar with those can feel right at home with Re : Zero. Talking of violence , Re : Zero has the most refreshingly non-fantasy violence I’ve seen all season. That might sound bad to some of you , a fantasy series ? With non-fantasy violence ? How can that be good. Well let me explain , a lot of animators these days take their idea of how these shows should handle their fight scenes for Jrpgs’ and anime MMOs’. So the fight scenes always descend to just characters with shining weapons throwing non-consequential balls of light at each other which pack no punch. Re : Zero I’m happy to report , almost makes me cringe with how brutal the combat is . The speed at which the characters move is breathtaking.I can watch a character get kicked in the face and feel it. But there’s also magic, over-sized swords and spirits to keep true to the genre. Characters designs are gorgeous, distinctly anime but not the shiny , plastic dolls that seem to be mass-produced by animators. They do a great job of portraying both sides of the story , one moment a blushing girl flirting with the main character the next a snarling beast wielding a scythe. The MC is hilarious , but also an easy character to root for. He plays on every trope that a typical fantasy MC goes through , meeting a cute girl , his first fight ect. The way he works himself and learns about the world is how I’m sure most viewers would. Watching how having the power to and constantly coming back from death , tolls on his emotional state is what cements him as a great character. Watching him lose his friends time and time again is heart-wrenching. A slight complaint that shouldn’t matter too much is he’s the very romanticized version of a NEET shut-in. Though I guess it wouldn’t be a very entertaining show if he just crawled into an alley and stayed there. The side characters too , are all plays on the type of character you’d find in an RPG. What’s great is how they’re always initially presented as just being another cut-out stereo-type but slowly reveal more of themselves every time the MC has to deal with them. I see this as a cultivation of all of White Foxes previous shows, the depth of Steins : Gate , the humour of The Devil is part timer and the feel and world of Akame ga Kill. It’s an amazing journey and I highly recommend it , not for a new-comers to anime fantasy however I think you’ll enjoy the humour and character far more with a couple of mediocre series under your belt first. On a scale ? I’m inclined to rank it above Akame ga Kill and the devil is a part-timer but slightly under Steins : gate.